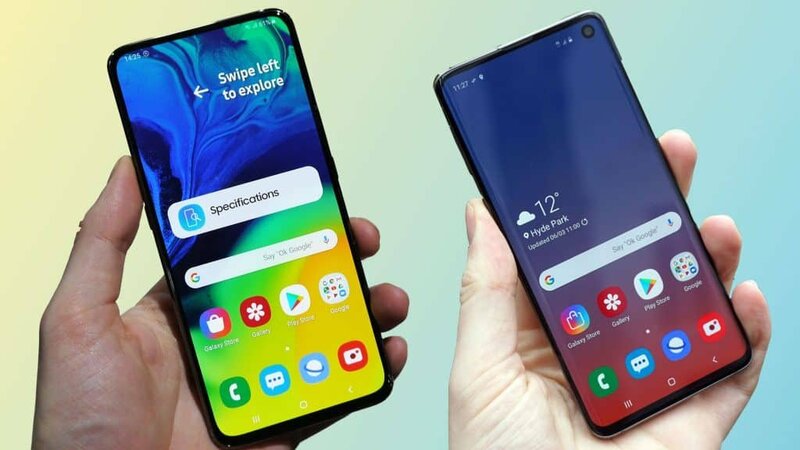 Samsung recently launched the Galaxy A80 and with it, we got to see the Infinity Display in action for the first time. We’re going to be checking it out today, so, feel free to tag along. So, this is Samsung’s Infinity Display. Standing next to the Galaxy S10, it kinda makes you wonder why Samsung didn’t use it for their flagship. Originally, most people, including us, imagined that the Infinity Display would hide the selfie cameras behind the screen. We were hoping that smartphone manufacturers were working on new technology that would make this possible. Obviously, that’s not the case here. So, how does it work? Maybe with a sliding mechanism? Or a mechanical motor that brings up the hidden cameras? Well, while there is a mechanical motor there, it doesn’t bring up the selfie cameras, but the rear, main cameras. How? That’s how! With a rotating lid! Are you not entertained? In all seriousness, though, it’s definitely a great idea. Instead of having two separate camera combinations, with the selfie cameras often being inferior, you get one powerful set for both selfies and “normal” shots. That’s a great way to get the best of both worlds without busting the budget. Overall, Samsung’s Infinity Display gives us the full-screen experience and allows us to use the main cameras for selfie shots as well. So, Infinity Display for the win, right? Well, not so fast! We feel like this is a great idea. We truly do! However! That’s not to say that the Infinity Display doesn’t bring some serious concerns with its design. Before we continue, let us say that if you’ve went through our Vivo Nex and Mi Mix 3 reviews, then you can probably skip this part. After all, it’s more or less the same thing. Same issues. For the rest of you, keep on reading. The first big concern is endurance and longevity. Moving parts wear out with time. Make no mistake. We’re talking about Samsung here and we’re sure that their products are of the highest quality. But, that doesn’t change the fact that moving parts do eventually wear out. After that, there is also protection. What if you drop your phone and the motor stops working? Speaking of protection, how about protective cases? 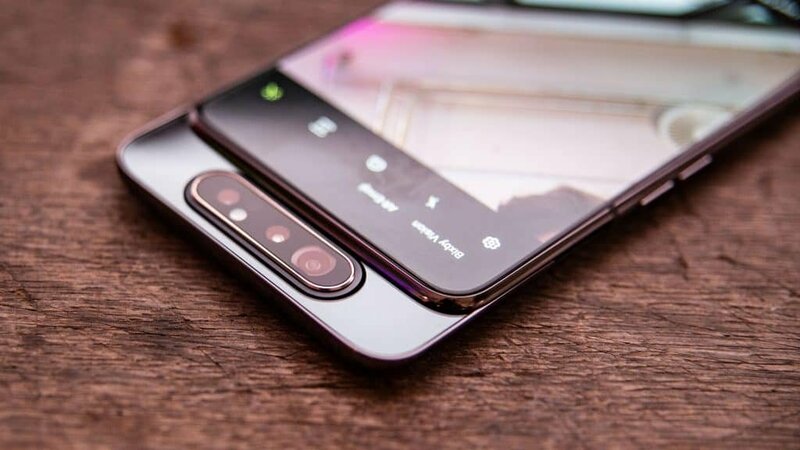 Making a case for a phone which has a pop-up camera that rotates around surely poises a challenge – if it’s possible at all. The good thing is that we’ve seen solutions for the second concern. Not for the A80 yet, but for the Mi Mix 3. They basically made cases with a gap on the top so that you’ll be able to bring up the cameras even with the case on. 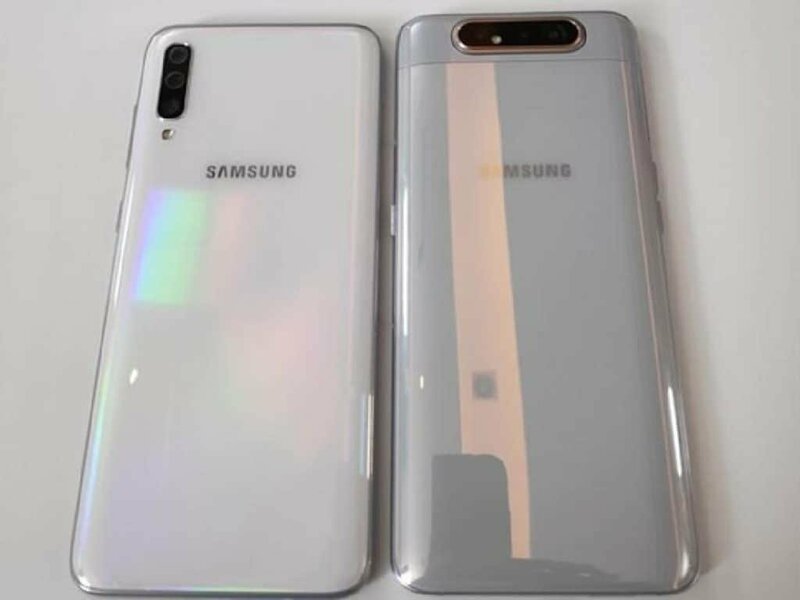 So, we suppose that this is viable for the Galaxy A80 as well. Still, the primary concern about durability persists. Other manufacturers who use more or less the same technology have mentioned that it can last for several years without issues. The problem is that we don’t have much evidence of that just yet. It’s going to take at least a few more years before people are convinced that this kind of design is just as endurable as what we’re used to. And that’s assuming that it is. What About The Actual Phone? So, get it. Samsung’s new design is awesome and comes with a couple of potential problems. But, what about the device itself? Frankly speaking, it’s pretty damn good. True. The cutout in the back is a little bit weird and doesn’t look so pretty. But, all things considered, how often will you checking out the back of your phone? Probably not that much. Samsung could’ve definitely made that back a bit more beautiful. But, still, for the first generation, this is not bad at all. We’d say that the real magic, and beauty, lies on the inside, which is where the Galaxy A80 shines. As mentioned before, the main cameras on the back are also the selfie cameras – and they are pretty darn powerful. We’re looking at a triple setup with a 48MP main camera, an 8MP ultra-wide sensor, and a 3D camera which is most likely used for face unlock. Certain features, such as optical zoom, may be missed by some people. But, still, this is quite a powerful setup no matter what. And with 48MP, you’d be able to zoom quite a bit without losing too much image quality – even if we’re talking about digital zoom. Overall, it’s kinda beefy. And the best part? It’s not exactly a flagship. But, at about 700 bucks, it definitely sits closer to the high-end range. Do keep in mind that pricing will most likely differ from country to country, though. Overall, we like it. However, the lack of headphone jack and SD card slot will most certainly be a deal breaker for lots of people. Or, actually, the lack of an SD card slot isn’t that much of a big deal. With 128 gigs of storage, chances are that you won’t need it anyway. But, the headphone jack? Numerous people are still using “traditional” headphones for their own reasons. Be it for audio quality, universal compatibility (used to be universal at least), or whatever it may be. So, that’s a bummer. Like what you see? Then don’t forget to share this article with your friends and follow us on Facebook and Twitter for the latest news, reviews, listicles, apps, games, devices, how-to guides!